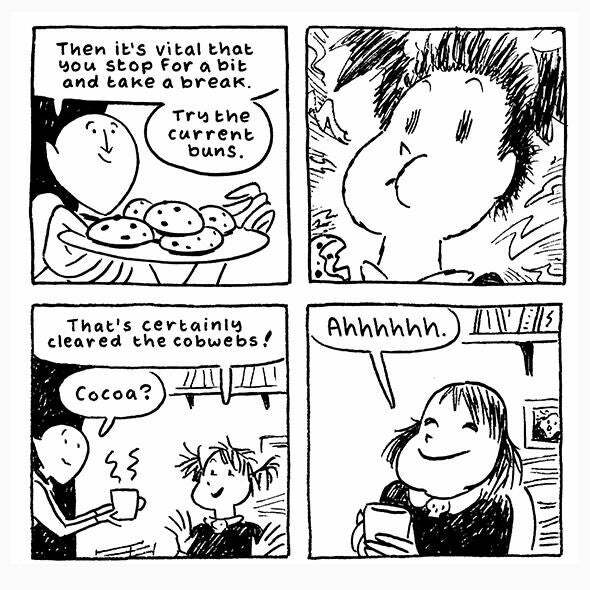 Andi Watson’s comic Princess Decomposia and Count Spatula, reviewed. An adorable all-ages comic about an ambitious chef in the underworld. Princess Decomposia is not loving life in the underworld. Her father, the king, never quite feels up to the duties of head of state, so the princess is constantly overworked, meeting with angry werewolves, glum zombies, and the like. And the king’s taste in cuisine is so bland and obstinate that the castle’s chef has left for the Dismal Vista Prison Block, where she’ll finally get the chance to shine. Enter Count Spatula, a cheerful, ambitious vampire chef who feels quite certain that his recipes will spice life in the castle right up. In Andi Watson’s lovable all-ages comic Princess Decomposia and Count Spatula, out later this month, the princess and the chef become fast friends, but find that the obstacles facing this odd kingdom underground might be too much for them to overcome. Andi Watson has been making wonderful comics for years, including the superhero romance Love Fights and the slice-of-life parenting tale Little Star (plus a whole run of Buffy the Vampire Slayer comics, of course). Princess Decomposia is a delightful story for kids and adults, and Watson’s deceptively casual inked panels are one reason why. His character design is elegantly simple, so these cartoony inhuman figures are able to feel and display a thrillingly human range of emotions. I really loved Princess Decomposia and Count Spatula and am so glad to have Andi Watson illustrating the February issue of the Slate Book Review. Princess Decomposia and Count Spatula by Andi Watson. First Second.